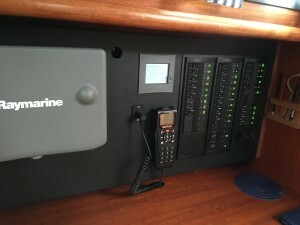 We recently completed the design, construction and fitting of a new control panel for Mahalo. The original control panel was too close to the hull, leaving too little space to install devices behind. It also only had a very small door that made it very difficult to gain access behind the panel. The owner asked us to remove the old panel and make a new fitted panel, asking that the whole panel could hinge down over the chart table giving full width access behind. 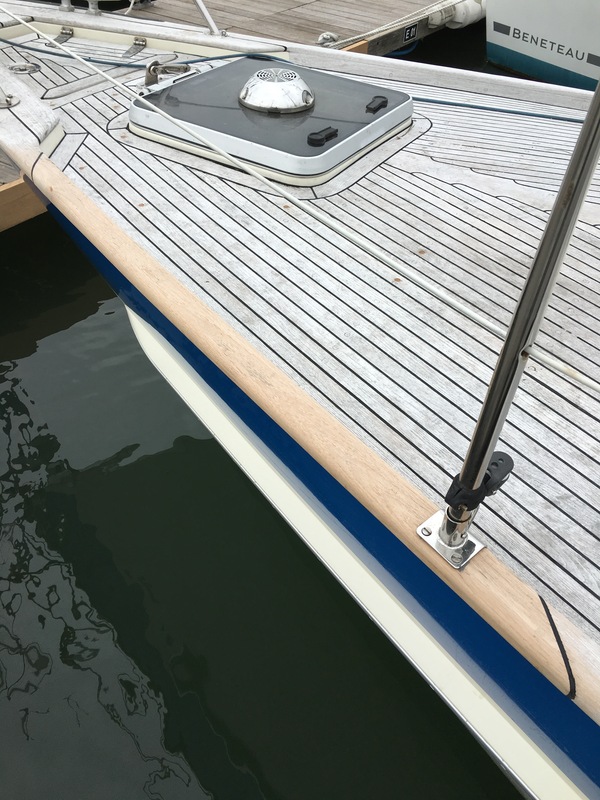 After several detailed discussions to agree on the approach and design, it was agreed that new mahogany mounts would be fitted each side, then the panel itself would be constructed from marine ply and covered with a matt black soft vinyl coating to give a technical look. The bottom of the panel is raised above the table slightly, giving more space to allow a chart to slide underneath. Hinges on the bottom allow the panel to open and a thumb catch at the top secures it when closed. 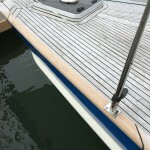 Firstly one of the solid teak toe rails had been fractured and the stanchion post bent in a collision. We investigated whether an in-place repair would be feasible but the toe rail was too seriously damaged. 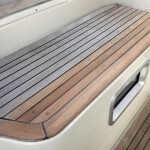 So a piece was cut out and a new section of teak fitted and finished. The stanchion post was also bent back into shape and polished. 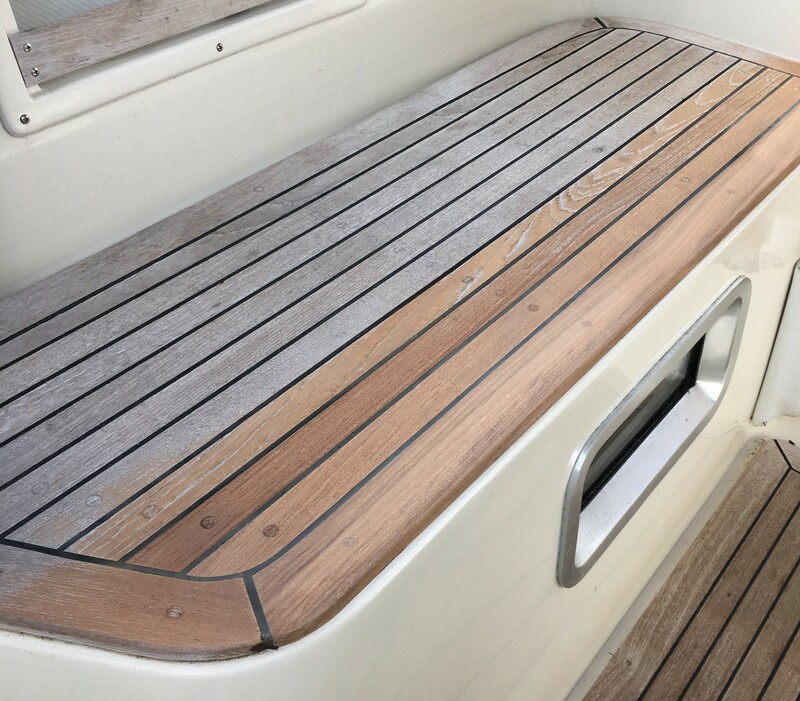 Finally, in the cockpit, a securing screw had rusted and burst, cracking a teak panel and allowing mildew to stain the teak to full depth. The panel was removed and a new one fitted and finished. I am absolutely delighted with the new control panel, it has transformed the chart table area, looks clean and professional, and gives me the access and space I need.